Address: 143 East 60th St.
You know how you can walk through the wrong part of Bloomingdale's and get an ambient coating of cologne and perfume without even trying? 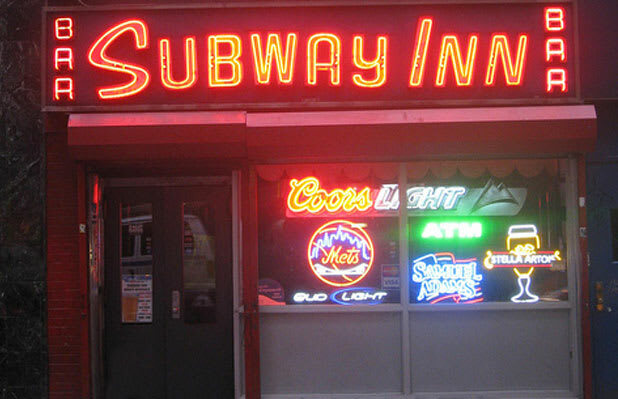 Well, the Subway Inn is the perfect stale-beer-and-piss antidote if that grave fate befalls you in Midtown. Located around the corner from Bloomie's glittering Lexington Avenue entrance, Subway glitters in a different sort of way: neon, and the special sparkle of vomit on porcelain at 5:30 on a weekday afternoon. This is a working person's commuter bar (the 59th Street subway station is a stumble away, with connections to Queens and the Bronx), but it's in Midtown, so those working people are just as likely to be secretaries and sales clerks as hardhats. The joint is a total throwback, and likely not long for this world given the Disney-fication of all parts of Manhattan. Enjoy it while you can.